Here is a video from a crane removal we did this week. From tree to chipper the material never hits the ground. Hands down the safest and most effective way to remove a tree. The chipper truck is used to haul a whopping 25 cubic yards of chips!! They are shot into the back of the truck from the chipper pulled behind it. The chipper has an 18" chipping capacity. That means we are hauling very few logs and chipping most of the tree on site very quickly. 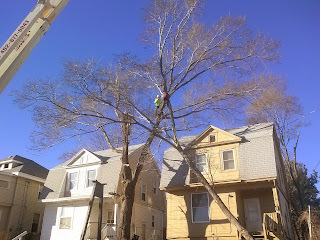 The bucket truck's main function is a 60' ariel platform for working on trees. It is handy for trimming and removal jobs. It allows us to work faster and safer than those who don't have one. The truck also has the capacity to haul 15 cubic yards of chips in the dump bed behind it! It pulls a 14' dump trailer. The trailer hauls a skid steer and stump grinder. Once those are unloaded the trailer is perfect for hauling logs. We use the Ford f-350 for hauling trailers. It has a huge snow plow for winter time and a sander in the bed.